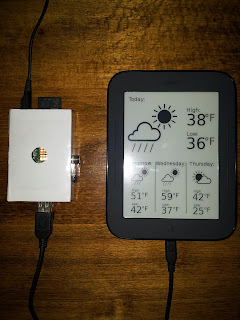 Raspberry Pi Notes: Nook - e-reader / Pi Display - Attempt 1. OK - This isn't strictly related to the Raspberry Pi as such - at least not yet, but it was because of running the weather station software on the Pi that I bought the Nook. 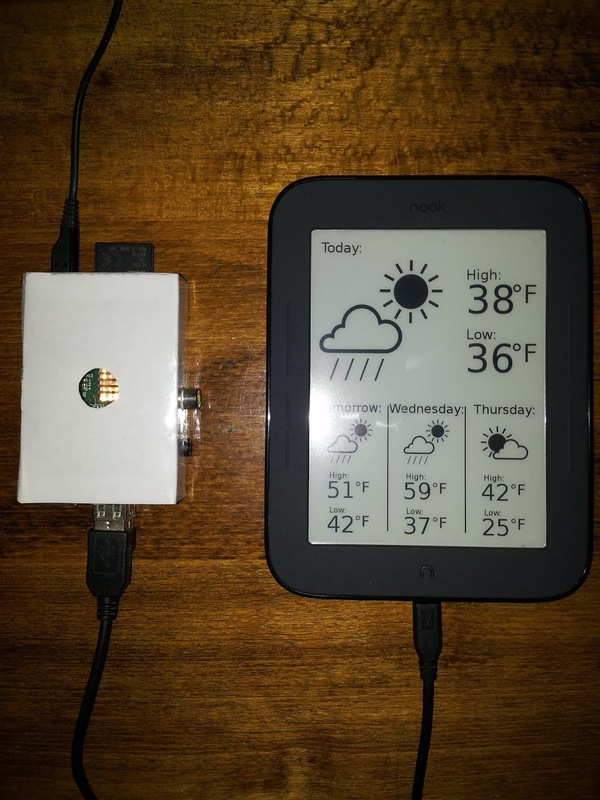 - I want to be able to use the Nook as a remote display, pulling data from the weather station's Raspberry Pi, and displaying it remotely - e.g. at my office for example, or stuck on the wall. - I've seen similar things with the Kobo etc. So, this is step 1. - So far, I've got the Nook, I've rooted it, go the market working, installed Kindle application and then got sidetracked into reading 'Life Of Pi'. - The Nook (Nook simple touch) seems easier to hold / read on than my kindle keyboard - It seems lighter, and easy to turn the pages with just a touch rather than using the side buttons as on the kindle, but that's maybe just personal preference. I can't see me buying much from the B&N Nook store as I've really committed to Kindle previously, although by using Calibre with a decoder, I could install my purchased items onto the Nook. - I didn't want to be tied into one platform in the long term...... Anyway. - This post is just for notes on the install so far. 1. - Register the Nook with B&N having turned it on for the first time and setup connection to Wi-Fi etc. 3. - Reboot the Nook with the NookManager and BACKUP the Nook before proceeding. 4. - Transfer the backup from the SD card somewhere safe. 5. - Repeat steps 3 and 4 so we know we have a backup from which we can hopefully recover the Nook should the root fail but nothing guaranteed. 6. - Reboot with Nook Manager and 'root' the device. 7. - Reboot and verify it's all working OK.
8. - Reboot with Nook Manager - make a backup at this stage. 10. - Assuming this has worked OK we now have market etc installed. 11. - Reboot and install Kindle app from the market. - I've now got that installed and working fine with my Kindle books. (28/1/13) Much googling, and playing with the screensaver on the Nook shows that what may be possible is to create a directory on the Nook 'screensavers' directory e.g. /screensavers/weather. Then, mount the Nook (in this case on the RPi), copy an image file into the 'screensavers/weather' directory on the Nook, then remove the nook. - The Nook will timeout and if you have it to display files from the 'weather' screensaver - Brilliant - it doesn't even need rooting to do that. Currently trying to get the script running on the Pi to create the image which can then be transferred to the Nook. Problem I've hit so far is that I can't 'rescan' the USB bus to remount the Nook periodically. - When it's 'removed' from the Pi, the device files are removed. - I can't find a way to get udev to think it's been replugged ..... yet. But can't find a way to remount. - The device files are gone, and I don't know how to rescan the bus to force recognition as if it has been replugged. (Update 3/2/13.) - I could find no way of re-establishing / rescanning the USB devices once one had been removed. - I don't mean just re-mounting a filesystem here, I mean once the device files are removed, I could find no way of getting them recreated / re-establishing as if the device had been replugged. - Anyway, see next post, I'm now getting the file via ftp periodically which is a better solution anyway.